Star City High School Cheerleaders and Mascot - Bruiser the Bulldog recently attended the Universal Cheerleaders Association Cheer Camp at the University of Central Arkansas at Conway. Each day, the squads learned new material and were judged on the performance of the new material. The ratings include Gold, Blue and Red Ribbons with Gold being the highest. On day one, the SCHS Cheerleaders earned a Blue Ribbon and Spirit Stick. Days 2-4 they earned Gold Ribbons and Spirit Stick. On the last day, SCHS Cheerleaders won 1st place in the Band Dance Competition, Overall Superior Cheer Squad, and the Spirit Stick. The team that shows greatest spirit, cheer ability, positive attitudes, and leadership wins the Banana. 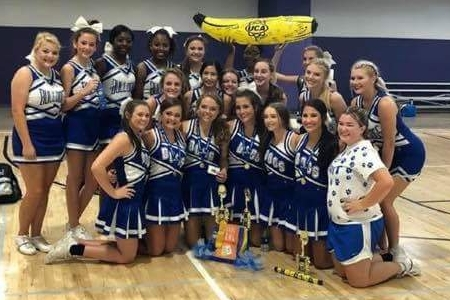 SCHS Cheerleaders took home the overall award, The Banana. Each SCHS Cheerleader was awarded a special ribbon that no other team received for their leadership and volunteering when help was needed. Three cheerleaders were awarded the Pin it Forward Award for their outstanding leadership. These cheerleaders were Olivia Reed, Mary Claire Reed, and Ennsleigh Levengood. Bruiser, Patience Rushing, made All American Mascot. Bruiser was also awarded Superior Ribbons and Superior Trophy and Spirit Stick. Approximately 50 cheerleaders tried out for All American Cheerleader. Star City High School is the only team where everyone that tried out for All American Cheerleader made it. All American Cheerleaders from left to right: Neelie Minor, Olivia Reed, Ennsleigh Levengood, Rylan White, Sydney Palazzi, Mary Claire Reed.